Passing the Apostolic Buck: A Succession of What Exactly? To this test, therefore will they be submitted for proof by those churches, who, although they derive not their founder from apostles or apostolic men (as being of much later date, for they are in fact being founded daily), yet, since they agree in the same faith, they are accounted as not less apostolic because they are akin in doctrine. The concept of “Apostolic Succession” involves a constellation of distinct concepts normally unconsciously associated with one another but which are actually logically independent of one another. It will not be easy to disentangle the different strands of thoughts which are associated with the idea of “apostolic succession”. However one hopes that by analysing the argumentation of the Church Father Irenaeus on this topic, one can bring some clarity to the issue. It is usual in Roman Catholic theology to distinguish between three kinds of apostolicity: (1) Apostolicity of Origin (2) Apostolicity of Doctrine (3) Apostolicity of Succession. Where was the papal church before there was a papacy? Whether any church has its origin in the church of the New Testament or not is simply a matter of faith. The Baptists and the Disciples of Christ make the claim that their church was the church at the time of the New Testament. Our Lutheran fathers never had the idea that they were… founding a new church. They were of the conviction that Christ’s one church was being renewed with the pure apostolic doctrine in contrast with Rome, which had fallen away from the Gospel. To provide the proof for the identity of any historical construction is always enormously problematical. One may, for example, speak of an English nation and of a German nation that continue through the centuries. But if one looks more closely, one notices how great are also the differences. In what sense are the English people of Henry VIII’s time identical with the 10 times as many English people today? In what sense are today’s German people identical with the people of Luther’s time? Was it anything more than a fiction when it was thought that the Holy Roman Empire of Byzantium was living on in the empire of Charlemagne and the German empire of Otto the Great until it expired in 1806? Is there more of an identity between the Roman Church of today and the church of Peter’s day than there is between the Roman Empire of the first century and the Holy Roman Empire around 1800? It has been observed that the difference between the church before Constantine and after Constantine is greater than the difference in the Western Church before and after the Reformation. Here the historical proofs of identity simply fail. Attempts to prove historical continuity by narrative construction is mostly a fictive narrative weaving affair. For a more in depth critique of this point I would recommend this post of mine. A much more theologically promising route would be to attempt to establish apostolicity of origin by either establishing the apostolicity of one’s teachings, or by establishing apostolicity of “succession”. Apostolicity of origin is to be traced via being grounded in apostolic doctrine or via “apostolic succession”. The concept of “apostolic succession” itself is often confused with the idea of apostolic consecrations, the idea that apostolic succession is “passed down” by the laying of hands and the imparting of some charismatic gift all the way back to the apostles. Hermann Sasse mentions the complete lack of evidence for the idea that the succession of an office is the same as the succession of a consecrations, and that in fact there is no evidence to suggest that in the early church when someone was appointed to an ecclesiastical office there would also be a “laying of hands” or consecration as well. When someone “succeeds” a previous office holder, that is merely to say that that someone merely takes over that office, not that he also somehow receives a laying of hands or consecration from him. Just as we say that Dr. Tony Tan is the successor of S.R. Nathan for the office of the President without suggesting that S.R. Nathan “ordained” Dr. Tony Tan for the Presidency, likewise do we say that someone succeeded his predecessor for the office of bishop without suggesting that he was ordained by his predecessor. To push our analogy further, just as it was the people who elected or “ordained” Dr Tony Tan to the presidency, likewise in the early church, it was often the people or the council of presbyters who did the election or ordination or appointment to the episcopal office. Thus, there is no historical evidence to suggest that there does exist this “succession of consecrations” or laying of hands all the way to the apostles. The Didache for example instructs the congregation to appoint or elect their own bishops: “Appoint, therefore, for yourselves, bishops and deacons worthy of the Lord, men meek, and not lovers of money, and truthful and proved; for they also render to you the service of prophets and teachers.” (Didache 15:1) The identification of apostolic succession with that of a chain of consideration would ironically only become more dominant in the 19th century. Did he actually touch his forehead? (i) A succession of apostolic teaching or preaching which has been passed on by some church official or preacher who has himself received the message from his predecessor and so on all the way back to the Apostoles. (ii) A succession of the apostolic charisma or gift or power to effect the sacraments, especially the Eucharistic Sacrifice. Now the question of “apostolic succession” can essentially be boiled down to what is the relation between apostolic consecrations and (i) and (ii)? Does apostolic consecrations somehow guarantee (i)? Does it pass on some power to empower (ii)? (i) is essentially the question of the magisterial role of “apostolic succession” or the “teaching office” of apostolic succession. The claim of “high church” apologetics is that somehow apostolic consecrations guarantees (i), that a succession of apostolic consecrations into an ecclesiastical office safeguards apostolic preaching and doctrine. (ii) is essentially the question of the sacerdotal role of “apostolic succession”, that somehow via apostolic consecrations is passed down some special power necessary for the performance of the sacraments. 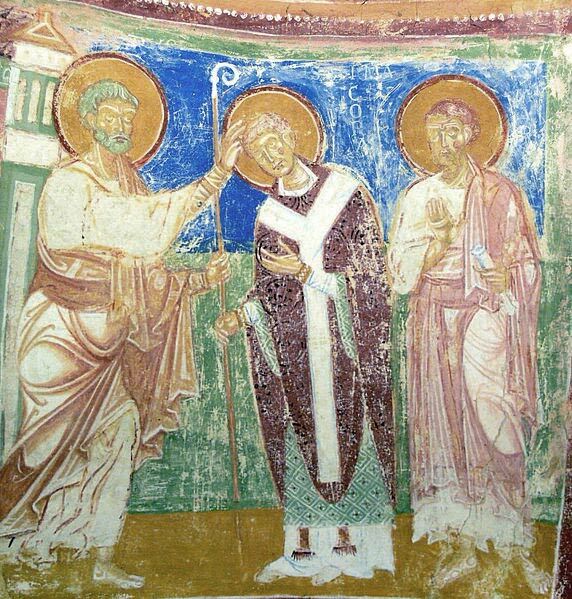 Let us look at the biblical discussion on the laying of hands before we discuss Irenaeus understanding of “apostolic succession” and how it relates to apostolicity of doctrine. If the “gift of God” which was given to Timothy through the laying of Paul’s hands is explained in the next verse, then this Holy Spirit gift is again not the authority or power to teach the correct things or the power to celebrate the Eucharist but instead it is the “spirit of power and of love and of self-discipline”. There is as such no evidence in the New Testament that the gift from the laying of hands was associated with the power or authority to teach apostolic doctrines or effect the Eucharist. 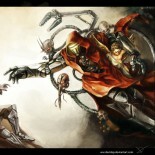 The gift by the laying of hands either gave extraordinary powers, e.g. speaking in tongues, prophecy, healing powers, etc, or it was more of a general blessing of the spirit’s strengthening of the character or soul of the person for the task ahead. 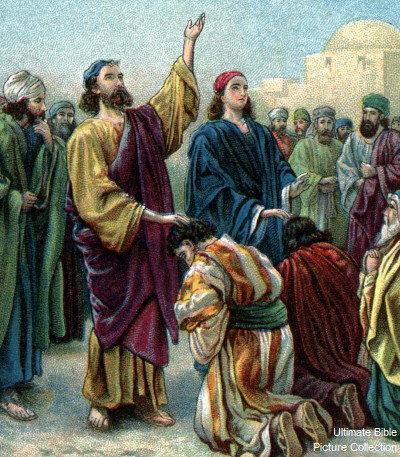 In fact in Act 13:1-3 a couple of prophets and teachers were commanded by the Holy Spirit to “set apart” or consecrate Barnabas and Saul for the work which he has called them. If the laying of hands was about some sort of apostolic gift, what need did the very apostle himself have for another laying on of hands by mere prophets and teachers? In addition to the complete lack of evidence for the idea that apostolic consecrations somehow grant the authority to teach the correct doctrines or effect the sacraments, most instances of the sort of gifts and blessings which comes from the laying on of hands have to do with extraordinary charismatic gifts or strengthening of the soul or power to carry out a certain mission. Having surveyed the biblical evidence, let us now turn to a Church Father who has discussed the concept of apostolic succession at very great length: Irenaeus. The text where Irenaeus engages this issue is in Book 3 of his Against Heresies. Against Heresies was written to refute the arguments of the Gnostic heretics. To be able to appreciate his arguments one needs to understand the arguments of the Gnostics, at least, as it appears to Irenaeus. Irenaeus’s argument here is quite clear. From no one else did we learn of the plan of our salvation then via the apostles. First the apostles preached in public, then later what they preached in public, they recorded and handed down in Scripture, “to be the ground and pillar of our faith.” Therefore, given that the apostles are our sole source of information concerning the Gospel of Salvation, it is impossible to assert that somehow their understanding of the faith was defective, incomplete, or lacking. They had perfect knowledge of the faith by the very power of the Holy Spirit themselves which came down upon them on Pentecost. When, however, they are confuted from the Scriptures, they turn round and accuse these same Scriptures, as if they were not correct, nor of authority, and [assert] that they are ambiguous, and that the truth cannot be extracted from them by those who are ignorant of tradition. For [they allege] that the truth was not delivered by means of written documents, but vivâ voce: wherefore also Paul declared, “But we speak wisdom among those that are perfect, but not the wisdom of this world.” And this wisdom each one of them alleges to be the fiction of his own inventing, forsooth; so that, according to their idea, the truth properly resides at one time in Valentinus, at another in Marcion, at another in Cerinthus, then afterwards in Basilides, or has even been indifferently in any other opponent, who could speak nothing pertaining to salvation. For every one of these men, being altogether of a perverse disposition, depraving the system of truth, is not ashamed to preach himself. At this point the high church apologist will say, aha! The succession of presbyters preserves the teaching of the apostles (or apostolic tradition)! 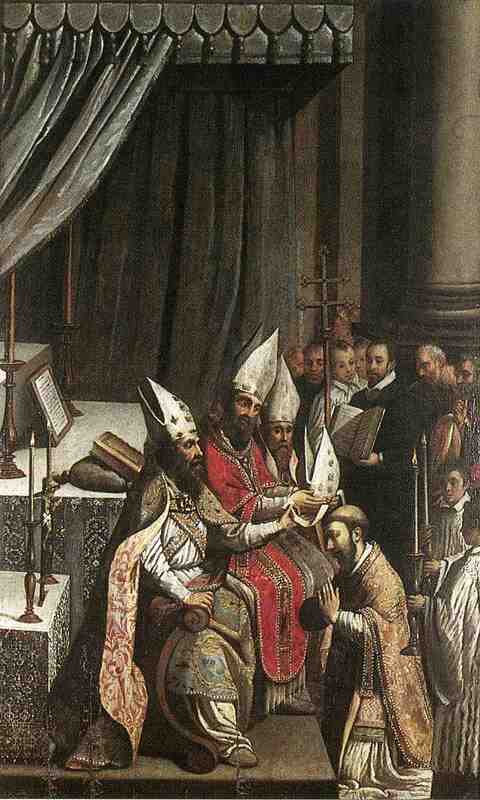 Ergo somehow the “apostolic succession” guarantees apostolic teaching and orthodoxy! Let’s slow down here for a minute. Irenaeus have yet to explain how the successors of the apostles preserved the apostolic tradition. What he certainly did not say is that they preserved it via some Holy Spirit charismatic gift given in ordination. In the very next chapter however Irenaeus explains how the successors of the apostles preserved the apostolic doctrine. …we are in a position to reckon up those who were by the apostles instituted bishops in the Churches, and [to demonstrate] the succession of these men to our own times; those who neither taught nor knew of anything like what these [heretics] rave about. For if the apostles had known hidden mysteries, which they were in the habit of imparting to “the perfect” apart and privily from the rest, they would have delivered them especially to those to whom they were also committing the Churches themselves. For they were desirous that these men should be very perfect and blameless in all things, whom also they were leaving behind as their successors, delivering up their own place of government to these men; which men, if they discharged their functions honestly, would be a great boon [to the Church], but if they should fall away, the direst calamity. Note well the argumentation of Irenaeus. First, he argues that the apostles took especial care that their successors were “perfect and blameless in all things”, all things, not merely that they were technically orthodox and willing to sign their name on some paper or creed. Secondly, he grounds this need on the distinct danger and possibility that “if they should fall away”, the “direst calamity” would result. Therefore one’s ability to avoid such calamity depends on their personal perfection, not because they have some charisma given by ordination. As such the idea that sheer consecration or ordination would somehow miraculously guarantee the orthodoxy of the official holder was simply not present in his mind. The ability of the office holder to teach what the apostles would delivered to them is still contingent upon his personal virtue or perfection. Why is Clement’s letter to be preferred to the Gnostic heretics? It is not because he somehow received some sort of tactile ordination or charismatic gift which somehow guarantees his orthodoxy. His letter is to be preferred simply because it is older and presumably therefore closer to source, the apostles themselves. It is usual for high church apologists to invoke the Holy Spirit as guiding the Church (read: the clerics) into all truth and to preserve the truth. And this Spirit given power to guarantee orthodoxy is supposedly given via apostolic consecrations. However this argument is a novelty to the early church. This is most certainly not Irenaeus’s argument which is that the successors of the apostles are to be adhered to because they were in direct contact with the apostles, learned the faith directly from them, and had a much older pedigree compared to the more recent Gnostics. It is easy to see why the high church apologists is forced to invoke some ordination charisma. None of the bishops of today were ever in direct contact with the apostles. Almost two thousand years separates them from the apostles and they can’t possibly claim that their contemporary doctrines or teachings were directly communicated to them by the apostles or even the disciples of the apostles. If [apostolic succession] is supposed to refer to a gifting of personal charismata, analogous to Elijah and Elisha or Jesus and Peter, then no Christian institution has it. We even see similar succession scenarios in other religions. Peter Escalante used the example of the Shaolin monks, where young men travel to train under a master. Judaism and Islam also have similar phenomena. Once the training is complete, the apprentice walks like the master, talks like the master, etc. In Christianity there is little similarity to this. Perhaps certain ascetics retained it, which is probably why Simeon the New Theologian believed the true succession to have moved from the bishops to the monks, but the metropolitan bishops certainly did not retain it. It is not unusual for a new bishop to have never so much as met his predecessor, much less trained under him personally for years. In fact, it is not even a “problem” for the new bishop to seriously disagree with or even wholly contradict his predecessor. He certainly does not cease being a bishop if he does so. To this day Rome has the problem of rogue bishops whose orders and sacraments really are “problem cases,” both valid and invalid depending on who you ask and when. The reason why high church apologists insist upon tying succession of apostolic doctrine of succession of consecrations is that they can no longer maintain the pattern of apostolic succession as actually taught by Irenaeus, having actually personally learned from the apostles or the disciples of the apostles. The successors of the apostles were to be preferred for learning the apostolic tradition, not because they are somehow office holders or have received some sort of consecration or ordination, the reason given is that they were closer to the source of the apostolic tradition, the apostles themselves. Obviously this argument cannot work for any contemporary bishop. For if we follow the logic of Irenaeus, that Clement’s letter is to be preferred for being older, then all the more should the Holy Scriptures to be preferred above all else being oldest of them all. I do not intend to rehearse an argument of mine concerning the sense in which the Protestant maintains the apostolic tradition (see here.) Before we end however I will make some brief remarks about the role of ordination and perhaps in future discuss the nature of the clergy or ministry. First by “ordination”, we can understand two aspects to it. One, it is simply being appointed to an office. Thus to say that someone has been “ordained” is on par to simply saying that he has been “elected” or chosen to an ecclesiastical office, whether by the congregation or the clergy. And as has already been noted, to be appointed or elected to an office is simply to assume the role of the office, this isn’t the same as “consecration” or laying of hands or whatever. In magisterial Protestantism, it is a matter of adiaphora how this election or choosing occurs. It can be by a congregational vote, a presbyteral assembly or episcopal election, etc, the forms can be many and variable. But the second aspect of ordination which is more important and pertinent to our case is that of the “laying of hands” or consecration. To develop a Protestant account, if this “consecration” is not to be understood as some voodoo passing on of some powers which one has received from one’s predecessors, then how is it to be understood? First, it is important to note that this consecration is essentially a prayer. This ordination or consecration is at its heart, the asking of God’s blessing to be upon the person that the person’s preaching may be effective and that the person’s life maybe preserved in holiness for his work of witness and that God’s grace would be with the preacher for his work. The laying of hands is the sign of the commitment of this blessing unto the person. Thus, it isn’t a person-to-person transfer of power, but it is a God-to-person bestowal of blessing, in response to the prayer of the consecrator. Naturally before we embark on any godly work, it is both right and obligatory that we ask God to bless the work, how much more indeed should we ask for God’s blessing for someone appointed to the work of the ministry? Although strictly speaking, this laying of hands and consecration is not necessary for the efficiacy of the work, yet it would not do to presume upon God and that we are definitely in need of God’s grace for any work we do in his name, it is for this reason whereby piety demands that we consecrate any person whom we have appointed to God’s work by asking for God’s favour and blessings upon the person as he goes about the work of the Lord. The idea of Apostolic Succession is particularly appealing to the romantic and traditionalist soul. The traditionalist emphasises “continuity” with the past, the romantic seeks to be part of some larger organic whole or maybe just something larger and grander than themselves. For the traditionalist Christian, apostolic succession provides a ready made narrative or picture for one to feel connected to the totality of the Christian experience. This narrative, no matter how aesthetic, beautiful, or romantic, is a complete fiction and simply cannot be justified by the testimony of the early Church Fathers. As our close reading of Irenaeus shows, it is clear that apostolic succession is a matter of personal instruction and learning of the apostolic doctrine from the lips of the apostles themselves. It is a matter primarily of doctrine and studying under a predecessor, not consecrations. This is what constitutes true “apostolic succession”; succession of training and learning of apostolic doctrine from those who have received it before them. But even if we wanted to believe in such a thing, as Pastor Wedgeworth has pointed out, it no longer exist even in high church denominations. Bishops simply no longer train or study under their predecessors, or acquire their knowledge of the faith from them, assuming that they have even met them in the first place. The doctrine, or tradition, which the apostles passed down to their successors can to be found directly at the source in the New Testament, which as Irenaeus himself points out, has been committed to the Scriptures; it can also be derivatively learned from those who have personally learned and trained under the very apostles themselves. This claim is richly confirmed by Tertullian whom we quoted at the start of this post; though there are many churches which are not founded by the apostles themselves, yet they are to be considered no less apostolic as long as they confess the doctrine of the apostles. To return back to the argument of Irenaeus: Why is the letter of Clement to be preferred? Because it is older than the recent Gnostic innovations. Rather than seek out romantic fictions of being part of some concocted narrative sustained by mechanical and superstitious episcopal touches, we should instead look to the source of our faith, hope, and wisdom, that which is older than the letters of Clement itself: The very written apostolic testimony to our Saviour Jesus Christ. Wow, simply brilliant! You have given me much to consider as I wrestle with this doctrine. Thank you and God bless! This entry was posted on March 20, 2013 by Rubati in Uncategorized.